Before getting started, I would like to take the time to remind readers that a Droid is Verizon’s branding of Android phones. Android is the operating system created and maintained by Google. It is open source and it is often customized by OEMs such as Samsung, Motorola, HTC, Sony, and LG. Now that that’s out of the way. I am an avid fan of Android and was highly anticipating Samsung’s unveiling of its latest Android device in London. Last year was huge for Samsung. First, Samsung’s Galaxy S II (SGS2) set the market on fire in May 2011 with over 3 million devices sold worldwide in 55 days. As of February 2012, Samsung has shipped over 20 million devices worldwide. 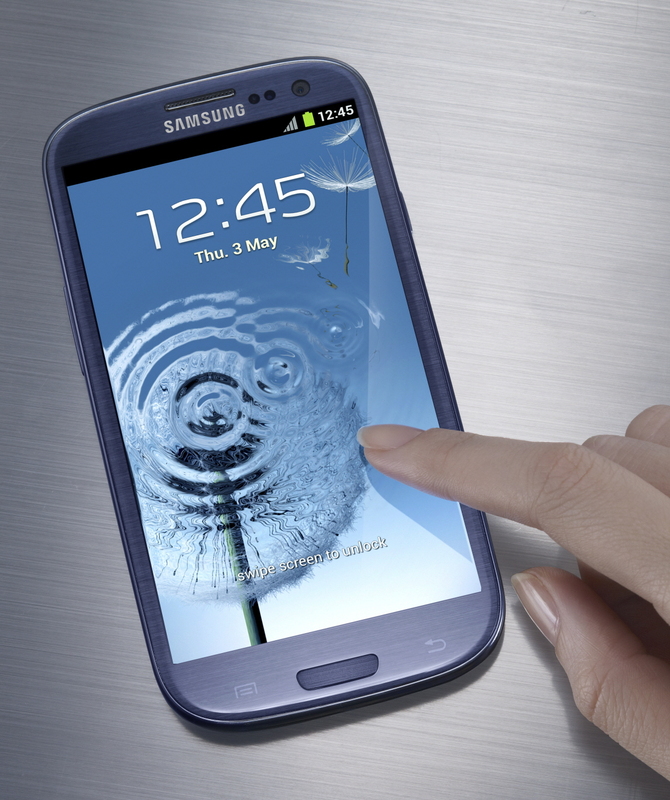 In the same year, Samsung caught lightning in a bottle again with its Galaxy Note in late October 2011. The Note is the largest Android phone with a 5.3″ screen and made use of the S-Pen, which many will remember from the PDAs of yore. Samsung’s Galaxy Note was criticized for its size and S-Pen. Its size made it closer to a tablet and critics thought the PDA pen was discarded for a reason. However, Samsung and the customers of the world proved them wrong. In actuality, Samsung found a unique segment of the smartphone market who wanted a larger screen – to have one device to serve as the middle ground between two (the tablet and smartphone). By the end of March 2012, Samsung had sold 5 million devices. So it should come as no surprise that everyone was anticipating Samsung’s next Galaxy phone. Speculation ran rampant about the specs of the “Samsung Galaxy S III” (SGS3) and people were hoping to hear an announcement at MWC 2012. When MWC came and passed with no SGS3, rumors and pictures of test devices littered the internet all the way up to Samsung’s official unveiling on May 3, 2012, in London. The Samsung Galaxy S III was unveiled to the public today along with new TouchWiz (TouchWiz is the name of the custom launcher Samsung Android phones use) features like S-Voice, Samsung’s answer to Apple’s Siri. In my honest opinion, this is not the superstar phone its predecessor, the SGS2, was just last year. The design aesthetic of the SGS3 is actually very similar to Google’s Galaxy Nexus with its curved corners that Samsung helped design and manufacture back in October 2011. One stark difference between the two is the return of physical buttons. Google’s Galaxy Nexus was the first and still only phone to successfully discard Android’s standard fare of buttons: back, home, search, menu, and task manager, instead choosing to use soft keys through a navigation bar. The SGS3 brings back a large home button and a touch sensitive button for back and task manager, although rumor says the American version will have soft keys. The screen is actually larger than the Galaxy Nexus at 4.8″ compared to 4.65″. Both use HD Super AMOLED screens while rumors were hoping for a HD Super AMOLED Plus for the SGS3. One of the trends for Android phones have been the increasing size of screens. Many iPhone users criticize this, but I am actually quite fond of the 4.3″+ screens. Even the Galaxy Nexus, which I seriously thought would be too big, fits very nicely in both my hand and pocket. The Galaxy Note at 5.3″ is a bit large and it’s a little strange to actually use it as a phone up at your ear, but it actually feels really good. I have no doubt the SGS3 will feel fine and it’s actually not that much bigger than the Galaxy Nexus. However, the Galaxy Nexus, much like its predecessor, the Nexus S, has a slightly curved glass on top, which, in my opinion makes it feel nicer and look sexier. The SGS3’s cameras are actually on par with its SGS2 sibling – a 8 MP rear camera and a 2 MP front camera. Compared to the Galaxy Nexus, this is a clear upgrade. I really have no idea why Google’s flagship phone skimped on the camera and it remains a sore spot for me and many other Nexus owners. It would have been nice for the SGS3 to have an even better camera, whether it’s a 12 MP rear camera or some other hardware to improve camera shots, but it’s still an improvement over the Galaxy Nexus. Probably the biggest upgrade is the processor: Samsung’s 1.4 Ghz Quad-core Exynos 4412. The SGS3 is one of the first phones to make the jump from dual to quad-cores, being beat to market by HTC’s One X with Tegra 3. While quad-cores are the future of phones and promise to increase battery life, the Android operating system and its apps are not optimized to take full advantage of the additional cores. Early tests of the HTC One X showed reduced battery life compared to the One X’s dual-core brother, the One S. In the long run, this is a great upgrade. 5. LTE Enabled in certain markets. So why am I not excited by this phone? It mainly comes down to two reasons. First, as mentioned above, it’s a very minor upgrade compared to its predecessor the SGS2. Second, is TouchWiz. This is purely a matter of taste. I feel AOSP (Vanilla Android) is the pinnacle of Android. It’s clean and simple without the bloat from the bells and whistles OEMs like to include. Did I also mention Ice Cream Sandwich TouchWiz still looks like Gingerbread? A classmate of mine, after flashing a leaked Ice Cream Sandwich ROM for his Galaxy Note, told me he couldn’t tell what changed between Android 2.3 and Android 4.0. In actuality, a ton of changes were made between AOSP Gingerbread and Ice Cream Sandwich (granted, many of the new features were kanged from OEM skins). A more dedicated look at AOSP versus OEM skins will be saved for another blog entry. I honestly feel this phone is not the next coming. People who purchased a Galaxy Nexus back in December (in the US) or have a SGS2 can breathe a sigh of relief. Your phone is still good. In some ways, the Galaxy Nexus is better with its Vanilla Android and quick updates from Google. People who purchased or were thinking about buying a HTC One X or Sprint’s HTC Evo One can safely go ahead with their purchase, safe knowing that the SGS3 is not very far ahead in hardware. Moore’s Law in technology almost guarantees your expensive smartphone will be outdated within a few months of purchase. Spending money on a minor upgrade going from SGS2 or Galaxy Nexus to SGS3 would be a waste since the phones that will appear at the end of the year will be bringing even better hardware. Motorola has been surprisingly quiet since its Droid RAZR released in November. They appear to be content with releasing various iterations of this model, but it will only be a matter of time before we see its next flagship device, which will definitely have a quad-core processor and LTE on-board. Apple, while not a producer of Android phones, is Android’s main competitor in the smartphone space. This fall we should see its “new” iPhone, which many will call a iPhone 5. If Apple plays its cards right, we could be in store for a big revision of the iPhone design – a bigger screen, NFC, LTE, and a quad-core processor and GPU. That is my hope, as a tech fan, anyway. So far, Apple has been happy to do minor upgrades to its iPhone line and seems very fond of the 3.5″ 4:3 aspect ration screen. Probably what I am most excited for is Google’s next Nexus. Set to come out toward the end of this year, 2012’s Nexus will be the first device with Android 5.0, Jellybean. It should hopefully have a quad-core processor – perhaps a TI OMAP 5432, a better camera (at least on par with SGS2/3), a HD Super AMOLED Plus screen, continued use of softkey buttons and NFC, a next gen LTE radio to increase battery life, and, of course, whatever other new ideas Google comes up with (how about new screen technology?) and Google’s continued support. If rumors are true and Samsung won the bid to work with Google to build the Nexus again, then Samsung will get another chance to prove their chops in design. In the end, whether or not the SGS3 is your next smartphone is up to you. Technology moves really fast and you need to decide what phone you won’t regret having for at least a year. Thanks for the comment! I’m probably slightly bitter about the SGS3, but I really do love AOSP. Even my Droid Incredible, rest its soul, was using AOSP soon after I discovered vanilla ROMs like CM7. Honestly, I think the SGS3 is a great phone and current prospective buyers should definitely consider it along with the Galaxy Nexus, Galaxy Note, and HTC One X or S, but it failed to live up to the hype surrounding it (for non-Android purchasers, the Lumia 900 and iPhone 4S are natural choices). I recall some advice I once read: “The secret to happiness in life is to reduce your expectations.” That may very well be the case here. I am going to do a blog post some other time about this, but I feel we are getting to a technological plateau in the mobile market – a place where the processors have advanced exponentially faster than other factors. Quad-core may already be pushing beyond this since the operating system cannot fully utilize it and apps most certainly aren’t. Battery life has become the biggest issue in my opinion and I remember Samsung saying 2012 will be the year they devote to getting battery technology up to par with processors. Whether increased battery life comes from a better LTE radio, efficient use of quad-cores, or (inclusive ‘or’) new screen technology such as Mirasol will be a huge boon for the smartphone industry. Even Apple has been wrestling with reduced battery life as they cram more tech (and pixels) into their iPhones and iPads. Android vs iOS will definitely be a topic for a future blog post! And what’s a smartphone OS party/war without talking about Windows Phone 7 and the upcoming Windows 8? Agreed. The Lumia 900 was such a strong showing for Windows and earned the right to join in the phone wars discussion. I’m glad I stumbled across your blog. You have a lot of great insights. Although, I have to disagree with the advice you read: “The secret to happiness in life is to reduce your expectations.” – if only because I’m somewhat of an optimist. I’m still trying to keep my expectations and my satisfaction high..